The current online shopping debate shows the tension that is going on in the retail industry. In the same way that the Internet is forcing the music and movie industries to look for new business models to combat piracy, globalisation is bringing about a drastic shift in the way that the commerce of physical objects is handled. 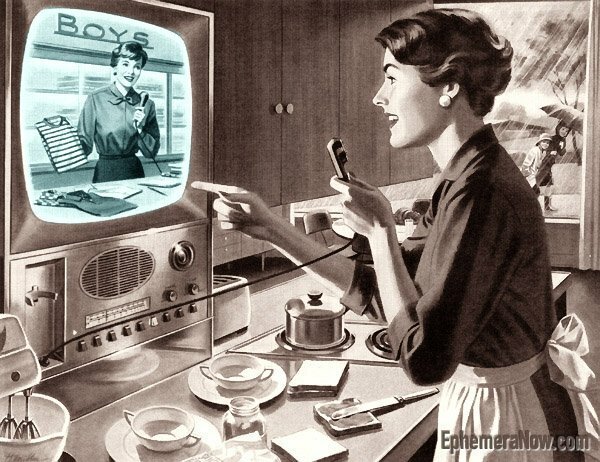 Here, I’d like to share a vision of what the future of retail might look like. You may have read similar stuff before – futurists probably predicted similar things years ago, but I feel we’re that much closer to seeing it become reality. In the future, you won’t buy products from stores any more. Shopping will be done at entirely from home through the Internet and 3D holographic representations of the products. With clothes, you’ll be able to try things on using a digital scan of yourself, and mix and match unlimited combinations including hair and accessories all at the same time. If you’re worried that it won’t be very realistic then you obviously haven’t watched a 3D movie or played a video game lately. The cloth simulations are so close to the real thing that they can even move and sway to a virtual breeze. You won’t miss out on the touchy-feely experience either, as haptic technologies will enable you to touch the item, mimicking the sensations of weight and texture. Everything will be delivered rapidly through a global logistics network, direct from the manufacturer to you, bypassing all of the middle men that exist in today’s supply chain: distributors, wholesalers, retailers – all cut out of the deal, meaning the lowest possible prices for you. It’ll spell the end of trips to the concrete jungle, fighting for parking spaces, arguing with overworked, underpaid shopping assistants and dragging heavy bags from one shop to another. What if I need it now? As the pace of the world continues to increase, who’s going to have the time to wait for a product to be shipped around the world? One possibility that this trend will give rise to is more local manufacturing, including manufacturing at home. That will allow for items to be delivered in mere hours and minutes, instead of days or weeks – like Japan today where on some Websites you can specify the time of delivery once you make an online purchase! What will we do with all the space? If we don’t need shops any more, there’d be so much more space available! More green parks for people to get back in touch with nature; land reclaimed for hyperlocal farming so that the food that you eat is as fresh as it possibly can be. I still can’t get over the fact that when we visited Jenny’s parents in Belgium they made fresh chips for us using potatoes grown on a nearby farm (I mean like a few blocks away). Of course shops aren’t going to simply vanish overnight. There must be a transition phase, and one way it could work is for brands to do the direct distribution model as above, but set up “experience centres” in various population centres. That is, you go to one of these centres to try the product, and they might even have some limited amount of stock on hand that they would sell you at a slight premium to cover the upkeep of the store, but otherwise they exist only so you can try before you buy. Ultimately you’d still go online to make the final purchase, to take advantage of the lower prices. I wonder if we aren’t already seeing this happen today. As one example, you may have noticed a lot of “Nespresso” stores opening in various shopping centres. Most people I’ve spoken to wonder out loud at why these places even exist – they don’t offer much over and above what you get at a department store. But you go there, and one of their friendly staff makes you a complimentary coffee of your choice, demonstrating the product. You may not buy from them, but if you were persuaded by the experiences chances are you’ll buy one somewhere – and ultimately the brand makes a sale, which works out the same for the parent company regardless of where you buy it from. Today, retailers like Harvey Norman demand lower prices from manufacturers (without passing the savings on to customers), product training for sales staff, and even payment for advertising products in their catalogues, etc. It’s a relationship that largely favours the retailers, and sometimes they get a bit too cocky. For example a couple of years ago Harvey Norman managed to piss off Nintendo so badly with their demands that they were banned from selling the Wii. You can see why the brand might as well set up shop themselves, given that they’d have full control. The main reason why I think this is going to happen? Almost all of this technology already exists today, and the only obstacle is greed. Just like the music and movie industry associations, they’re fighting tooth and claw to keep from becoming irrelevant in the minds of consumers, trying every trick in the book to pursuade you that they’re adding value to the supply chain. But they’re not. And the sooner we give them the flick, the sooner we’ll arrive at the future of shopping. what’s your opinion about government tariffs to protect certain industries and jobs? Broadly speaking I’m not a fan of protectionism, even though my own job hangs by a fine thread and last year I watched several of my colleagues get dumped and their roles outsourced to India. But ultimately my idea is critically dependent on free and unfettered global trade, so I’d necessarily be against it. So does that mean I support the death of industries and the loss of jobs? Yes. But only inasfar as this idea is but one part of a bigger picture that I don’t quite have the ability to articulate right now.